Knock it off is a fun unit with floating ball targets. Knock it off can be used in two ways. For younger kids, the floating balls can be knocked off the cone with a larger ball. 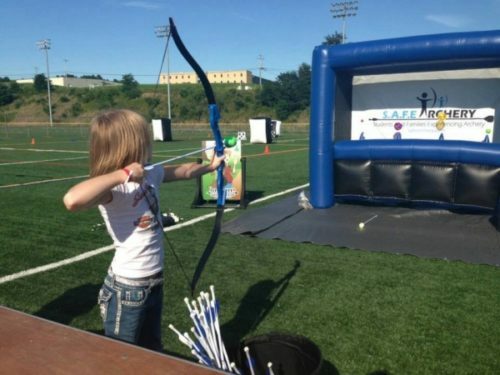 For older kids (and adults) we have archery bows and arrows (the arrows have padded tips) that allow you to aim for the floating balls and knock them off with the arrow. It is quite challenging and allows guests to use an a 20 lbs. archery bow in a very safe environment. This unit rents for $125 for 3 hours. Book all three midway games and get them for $300. Knock it off, is a fun unit with floating ball targets. Knock it off can be used in two ways. For younger kids, the floating balls can be knocked off the cone with a larger ball. For older kids (and adults) we have archery bows and arrows (the arrows have padded tips) that allow you to aim for the floating balls and knock them off with the arrow. It is quite challenging and allows guests to use an a 20 lbs. archery bow in a very safe environment. This unit rents for $125 for 3 hours. Book all three midway games and get them for $300.